The moody, rootsy, punk-adjacent rock of Restorations has always represented a war between the grounded and the ethereal. Maybe that’s its raison d’etre. It forges broken relationships and melancholy into something divine, while pulling divinity down from its pedestal and into our gutters. It’s a marriage between why we play music in the first place—the expressive drive; and how we play it—the artistic drive. The end result sounds like an amalgam of Fugazi, Constantines, The Menzingers, Hot Water Music, and My Bloody Valentine—and the only ones playing this particular amalgam are Restorations. LP5000 is their latest full-length, on the heels of three well-loved albums and a handful of singles. This one is noticeably shorter, seven songs at twenty-four minutes—a grey area between album and EP that in the end, feels more complete than many longer works. Here, they’re just as anthemic, vulnerable, and experimental as they’ve always been—but the heart of Restorations is still in rock ‘n roll. Album opener “St.” opens with feedback before succumbing to a steady, hypnotic, and bassy drum rhythm. Drumming usually escapes me completely, I’m as arrhythmic as they come and for me, a song’s quality usually starts and stops at its lyrics and melody. But here, and across the entirely of LP5000 I was entranced by the mesmeric rhythms—they don’t just back the music here, they’re as fundamental as the plaintive vocals and spidery guitar lines. Between the drums, grungy chorus, and the short, but whiplash guitar solo, “St.” serves as a reminder of Restorations’ roots—a broken-in, world weary vision of rock ‘n roll. “Nonbeliever” is a highlight of the album, with its tense shuffle, portrait-like lyricism, and emo-influenced palm-muted guitar riffs. The lyricism here is beautiful, softly political, and at points conversational. I always appreciate when songwriter’s bring a sense of time, place, and age into their words. “Said you’ve found the trick: just be bad at your job/ If you burn all the fries, they’re gonna make you the king,” paints a picture of youthful struggle, the self-deprecation we utilize to make peace with a living we don’t want to fight for. “Nonbeliever” is an ode to being born into adulthood, chronicling a struggle doomed to bloom into complacency. There are some interesting choices made on LP5000 production’s, but with a band like Restorations, no choice really feels outside their already fairly broad boundaries. The programmed beat, sounding like pulsating static, on “Melt” comes to mind. But it’s used to even greater effect on ending track “Eye,” giving a sort of eerie and desolate tone to the slice-of-life narration. The dead-air drums in the background, a perfect juxtaposition between the technologically-complex world we live in and the human relationships that define us. It explodes into squealing guitars and a massive chorus, the sound of Restorations using every tool at their disposal to feel and be felt. LP5000 is more of the same, when the same has always been top-notch. Restorations is a band with nothing to prove, and yet, they are one of the most exciting working in the greater punk rock arena. They’re as lyrical as their contemporaries and just as catchy, yet they push their sound into spacey, angular directions. Perhaps the band’s greatest feat is making this feel effortless. 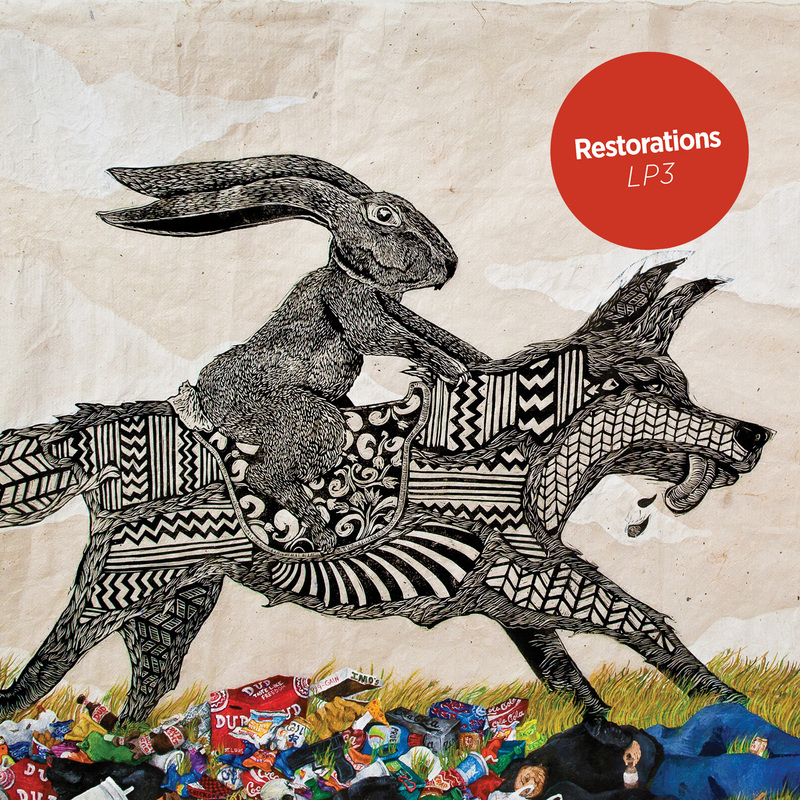 Restorations experimentation is an extension of their identity, it comes off as natural and unpretentious. LP5000 is seven great songs, and everything else is just what it took to make them great.